The Memorial Garden of St. Paul United Church was created at the request of the congregation in July 1992. It provides a final resting place for the cremation ashes of church members and others who have had a significant association with our congregation. Located along the outside west wall of the church sanctuary, the Memorial Garden is marked by a handsome, hewn granite stone. 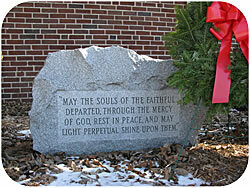 The stone is inscribed with the words of a traditional Christian prayer for the deceased: “May the souls of the faithful departed, through the mercy of God, rest in peace, and my light perpetual shine upon them.” The garden is very simply landscaped with seasonal flowers and small shrubs which are green the year-round. All cremation ashes are "scattered" in the Memorial Garden. In other words, the cremation ashes are mixed with the garden soil. Apart from the granite stone with the prayer for the deceased, there are no individual markers in the Memorial Garden. Nor is any record kept of the exact location in the Memorial Garden where the ashes have been interred. However, each person whose ashes have been interred in the Memorial Garden is remembered by the addition of brass plate to a walnut plaque that is located in the west lobby of St. Paul United Church. Each brass plate bears the name of the deceased, as well as the years of their birth and death. In addition, a record of each person's death is kept in a special registry maintained by the church office. Those who choose cremation are usually memorialized in a special service at the church. Thereafter, the cremation ashes are customarily interred in the Memorial Garden as part of a separate and private committal service with one of the church pastors officiating at a time chosen by the family. Attendance by family members at this separate committal service is at their own discretion. A minimum $100 contribution is requested by St. Paul United Church of Christ of those who wish to inter ashes in the Memorial Garden. Each contribution is added to the church's Memorial Fund to cover the costs of individual memorial plates and the actual maintenance of the garden area. In instances where this requested contribution would cause undue hardship for the family of the deceased, a pastor can adjust or waive the expense. Since at death the final disposition of cremation ashes is the responsibility of the next of kin, persons who desire to have their ashes interred in the St. Paul Memorial Garden should inform their families of their wish. The Church Office also has forms on which members can record their own intentions regarding a memorial service and the subsequent interment of ashes. These forms are kept on file at the church and can be used as a guide for survivors at the time of death. Additional arrangements can be made directly with the church pastors. Specific questions about the Memorial Garden and private interment arrangements can be answered by the church pastor or the administrative assistant for the church office at 313-291-1221. While making advance arrangements for interment in the Memorial Garden, some church members and friends may wish to remember St. Paul United Church of Christ in their wills or trusts. Such bequests are always welcomed. In making a bequest you will need to designate "St. Paul United Church of Christ, Taylor, Michigan" as the beneficiary. You may also want to indicate any special purpose for which you would like the bequest to be used. In instances where no express purpose is declared, the church's executive committee will use its own discretion as to the best use of the bequest.